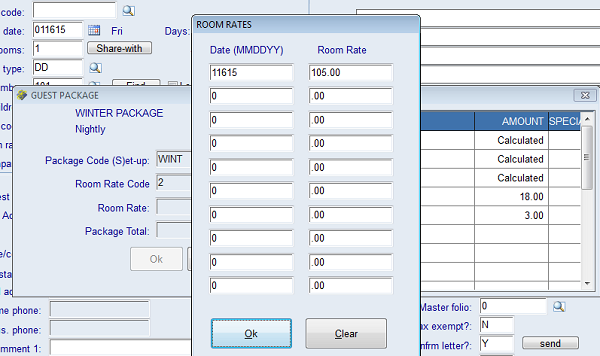 Hotels with frequently changing rates can enter those rates in a spreadsheet and import them into Execu/Suite rather than using season records. However, if you can accomplish what you need within Season Records and rate setup, that is the best way to do it. If your rate structure is complex, you will need multiple spreadsheets. Read this entire document before starting. The instructions will make more sense if you see the entire process before beginning. Here is how Row 1 looks, followed by Rows 2 and 3 populated with the applicable information. You may add notes to the spreadsheet as long as they are not in a column with a header. You can go as far into the future as you wish with your spreadsheet; most users enter between 365 and 730 days. You need a separate spreadsheet for each rate code. You can name them RATES1.CSV, RATES2.CSV, and so on if you wish. This makes it easier to import the correct one and easy to select the correct one when editing. You also will need a separate CSV file for single/multiple/extra person rates. You might name them RATES1S.CSV or RATES2M.CSV, etc. if your rates are the same for one person and multiple persons (excluding "extra person" rates) you do not need separate sheets. Furthermore, you will need a separate CSV file for packages. 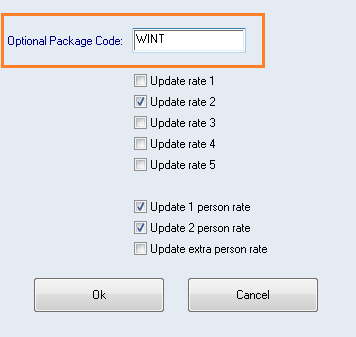 For example, if you have special rates that apply to package WINT you might create a CSV file called RATES-1S-WIN1.CSV to import those rates only for that package. Make sure to save the files on the server or computer where Execu/Tech was installed, in the same folder as your Execu/Tech files. In the example above, it is C:\executech\hotel but yours might be elsewhere. If the CSV files are not in the Hotel folder, the software will not find them. 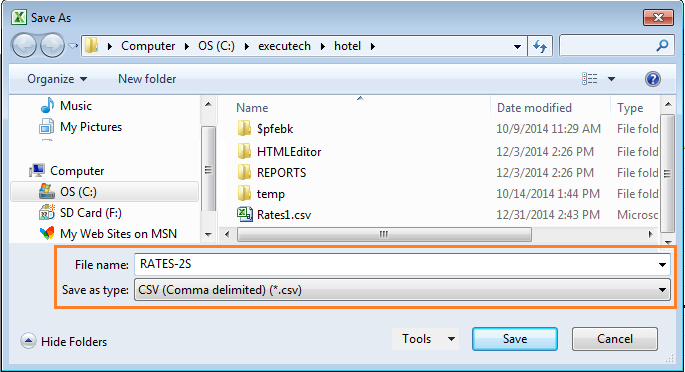 The ExecuTech hotel folder shown below has three RATES* files. Rates1.csv is the basic template. RATES-2S.CSV is the file for Rate code 2, single person. 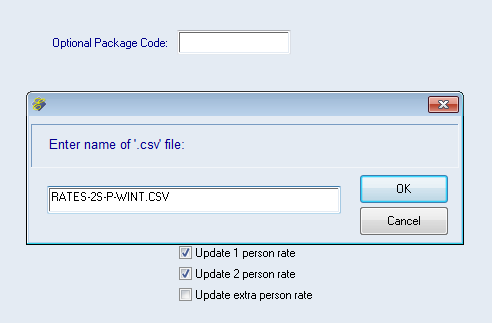 RATES-2S-P-WINT.csv is the file for Rate code 2, Single person, package WINT. Note that you must set up your package in Manager/Setup / Control Files Setup (Room/Charge/Payment code setup) prior to importing rates for the package. See Guest Packages. 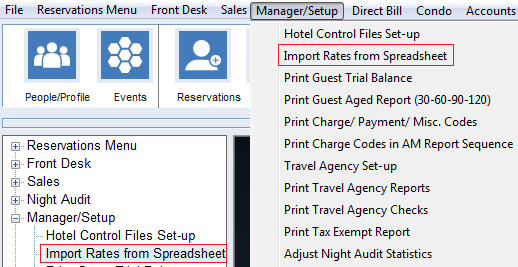 If you have several rate sheets to import you can open your ExecuTech Hotel folder to display them, as shown below, in case you forget the file names. You also can write the names down. BACK UP YOUR FILES BEFORE IMPORTING THE RATES. After you have created the files go to Manager > Import Rates from Spreadsheet. Your menu might have a different title for this program. If you do not see this menu item, look in System Maintenance. If you do not see it there, contact Execu/Tech to request that this item be added to your Execu/Tech menu. At the prompt, enter the name of the file with the rates to import. Remember to include the file extension (.csv). Select the rate code to import. Select the number of persons or extra persons. Do not fill in Package Code unless you are specifically importing package rates. Below is an example of a reservation made after the rate import. Remember, the package must be set up before you enter the rates. See Guest Packages for instructions. Create a spreadsheet for the package's rates. You can use the same spreadsheet for more than one package, but you must import the rates for each package separately. Run "Import Rates from Spreadsheet" as shown above. At the prompt, enter the name of the file created for the package rates. 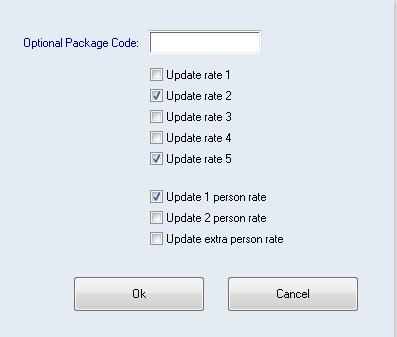 Next, enter the package code and the other parameters applicable to these rates.